Tata Nexon KRAZ is a limited edition model. The limited edition Nexon is available with both petrol and diesel engines in two variants: KRAZ and KRAZ+. While the KRAZ is based on Nexon’s XM variant, the KRAZ+ is based on XT. 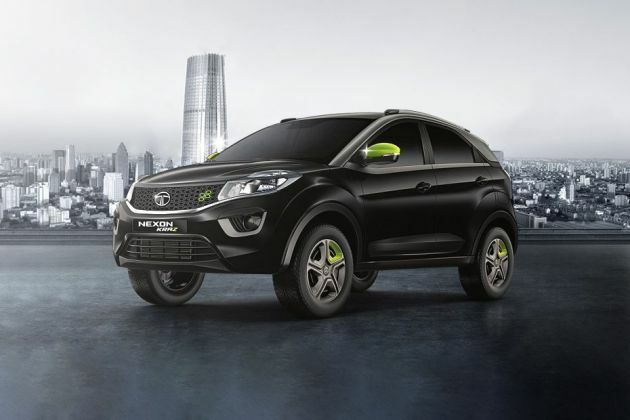 The limited edition Nexon is available in black-grey dual-tone exterior colour, which is not available on the standard Nexon. It also gets neon green highlights on the ORVMs, front grille and wheel covers. On the inside, it gets neon green stitching on seat covers and highlights around the AC vents. The KRAZ and KRAZ+ get the same set of features as the Nexon XM and XT, respectively. The Tata Nexon KRAZ is priced at Rs 7.14 lakh for the petrol model and Rs 8.07 lakh for the diesel (both prices ex-showroom). The KRAZ+, which is better equipped than the KRAZ, is priced at Rs 7.76 lakh for the petrol model and Rs 8.64 lakh for the diesel. The Nexon KRAZ is available with the same 1.2-litre petrol and 1.5-litre diesel engine as the standard Nexon. Both the engines make a maximum power of 110PS. The petrol engine returns a claimed mileage of 17kmpl while the diesel engine is claimed to return 21.5kmpl. Check out the Nexon KRAZ diesel here. Multi Drive Modes(Eco, City, Sport) "